The D’Amelio for Senate campaign is touting an event titled “Education in Norwalk, a question an answer forum” at 7:30 p.m., Oct. 17 at Nathan Hale Middle School. 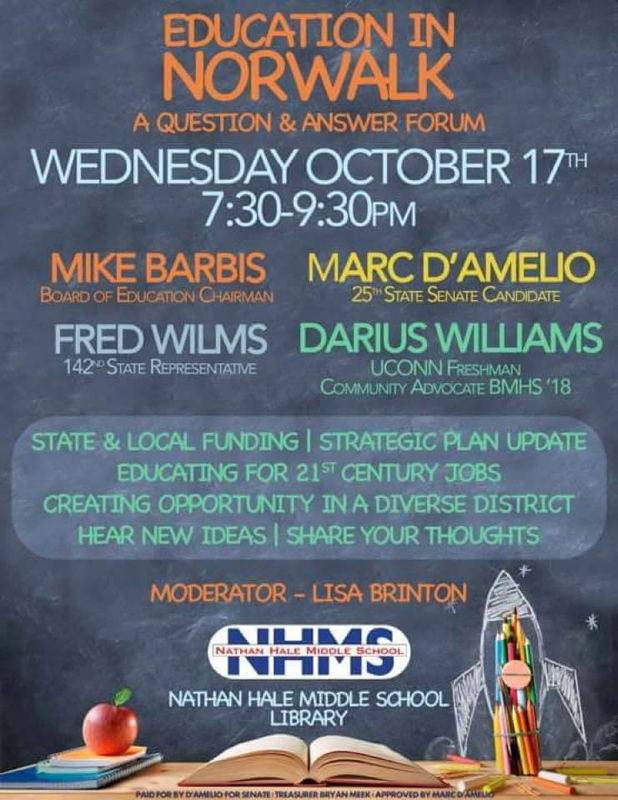 Former Mayoral candidate and Red Apples founder Lisa Brinton will moderate the forum, which a flier says will include Board of Education Chairman Mike Barbis, State Rep. Fred Wilms (R-142) Darius Williams and D’Amelio. The flier was circulated Tuesday, and Williams promptly dropped out. Members of the Facebook page Norwalk Parents for Education had a lively discussion about the event. BoE member Barbara Meyer-Mitchell asked, “So this is a campaign event?” and a member replied, “or a Duff-bashing party methinks”. Multiple people asked if State Senate Majority Leader Bob Duff (D-25) had been invited, and received no reply. Duff did not respond Wednesday to an email from NancyOnNorwalk, asking about the event. Barbis and Williams are Democrats. One Facebook commenter said Barbis is “barely” a Democrat; Barbis did not reply to a late evening email requesting comment. Williams said Wednesday evening that he has too many commitments to devote the time the topic deserves. D’Amelio campaign manager Isabelle Hargrove said she has not confirmed additional panel members. The Nathan Hale logo on the flier makes it look like the school is sponsoring the event, one group member wrote. Another replied that Barbis had asked to rent the space. “I think it’s a great idea but comes off as mainly for campaigning (unless D’Amelio plays a current role in our educational system that I’m unaware of),” another said. Another asked if Wilms’ opponent, Democrat Lucy Dathan, had been invited. “If this is a campaign event it should be clearly written in the visual,” one said. The flier includes language noting that it was paid for by the D’Amelio for Senate campaign. Brinton was part of the conversation but declined to be quoted here. “Sorry, given the toxic political environment it just seems partisan. I would say the same if it was an event with just democratic candidates,” a mother said. “It just seems a bit uneven. Sounds like it’s just an event to showcase Republican candidates with two Dems thrown in there to make it look like it’s just a ‘discussion’,” Parkington replied. “How quickly forgotten the bipartisan panel on education funding in January that Barbara was a panelist with Bob Duff and others which was held in City Hall,” a member wrote. Duff’s January education forum featured Connecticut School Finance Project Director Katie Roy explaining changes to the state’s Educational Cost Sharing (ECS) formula and himself, Norwalk Federation of Teachers President Mary Yordon and Meyer-Mitchell on the panel. Duff, Yordon, and Meyer-Mitchell are all Democrats. At the time, Hargrove noted in a comment on NoN that no Republicans were included in the forum, despite Duff billing it as an information session regarding the state legislature’s recent “bipartisan” budget. That “was not a campaign event,” Meyer-Mitchell replied to the commenter. “With all due respect, incumbents are always campaigning,” another commenter shot back. “Well, I certainly wasn’t. I was at that event and have been all along looking at possible solutions to state funding issues,” Meyer-Mitchell said. The Connecticut School Finance Project has launched an interactive Candidate Voter Guide, with brief biographical and campaign information about each candidate running for office this November, according to a press release. The guide does not include registered write-in candidates because the list has not yet been released, the release noted. State Rep. Gail Lavielle (R-143) has been endorsed in her drive for reelection by the Association of Retired Teachers of Connecticut (ARTC) and recognized by the Connecticut Education Association (CEA) for honor roll distinction, a press release said. Lavielle’s positions on adequately funding our health insurance and pension accounts align with the retired teachers’ positions, Bradley Hayward, ARTC PAC Co-Chair, is quoted as saying in an Oct. 2 letter to Lavielle. The CEA does not endorse candidates and has now developed a Legislator Report Card, the release said. It explained that Lavielle’s honor roll distinction was earned by her support of teachers and education. Lavielle is being challenged by Stephanie Thomas, a Democrat. Ms. Gail Lavielle has long been Norwalk’s outstanding Legislator. With an unmatched professional background of major achievement. And highly regarded by colleagues in Hartford on both sides of the aisle. I’m very disappointed that most Democrats view an education forum as a partisan campaign event. What will it take for both sides to come to the table and work on solutions for Education funding for Norwalk? The partisan politics is exhausting – grow up and do your job! Government is about compromise and doing what’s best for residents – you can’t operate effectively in a bubble. I think Democrats would be happy to view this as a non-partizan education forum if Lucy Dathan and Bob Duff had been invited. @ Galen, It is non-partisan, bi-partisan and not about Marc. When asked to moderate, it was positioned as a discussion about education funding and its impact on Norwalk. An issue near and dear to my heart, for well over a decade. You have the Chairman of the Board of Education and a Democrat, who has served for over six years and the former Chair of Norwalk’s BET and current state legislator, who understands the ECS formula, the lawsuit, and the state’s overall finances. He happens to be a Republican. That seems pretty non-partisan to me and from what I can tell – pretty focused on Norwalk’s current budget plight. This should be easy. Who paid for the rental of the Nathan Hale School facility? If the topic of conversation is important enough to the opposition, why wouldn’t they approach the organizers to split the rental cost and discuss their position and plans for education in Norwalk and CT? I’ll tell you why – the new way of politicking is to say you never received an invitation, decline an invitation or publicly state it’s a campaign event for the opposition. However, in this scenario, the losers are the students, staff and taxpayers. An informed voter has power folks. Lisa, with all due respect, the “opposition” did ask to participate. They were told no. They were not told sure we would like to hear what you have to say, if you split the costs. There is nothing wrong with the D’Amelio campaign having a campaign event. Lets just be honest about it. Honesty is a good example for the students of Norwalk. As Marc D’Amelio’s campaign manager, I oversee organizing this event. None of these candidates have approached me to participate. I suspect they would find it uncomfortable and I am quite certain that Senator Duff has no interest in crashing Marc’s event. Furthermore, as a comparison, I don’t believe Marc is invited to help serve ice cream or pasta with Bob Duff during one of his social events held during campaign season. Each candidate is free to choose how they interact with the public. Marc is a problem solver with a genuine desire to work with others and use his ideas and skill set to make a difference. Regardless of party affiliation, the panel was assembled because Mr. Barbis and Mr. Wilms are valuable experts and share Marc’s desire to find common ground and solutions to an unresolved State issue that shortchanges Norwalk. While it appears others are too busy digging up dirt and destroying lives, this forum is a step in the right direction. I find it much needed and why I decided to join Marc’s team after spending years demanding action and getting no results.